I have a race report from the 15k I did on Sunday almost ready, but in the meantime, here is a follow-up to the Hellebuyck doping scandal that you should read if you haven't already. Is that messed up, or what? Or how about Boston maybe adjusting their qualifying standards in wake of this year's registration nuttiness? And then, after you've read that, do me a favor and go over to Sarah's blog and leave a comment. She has offered to donate $1 per comment to charity. 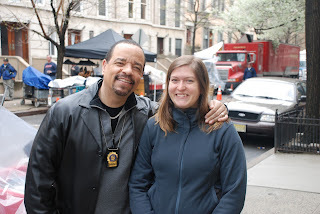 And now, since I'm traveling home for the holidays today and can't be bothered to write anything of substance, I offer instead a random picture of me with Ice-T on the day they filmed Law & Order: SVU on my block. He's obviously done this before. I look way too excited. desk, writing a conference paper. way to tug at my heart strings. while ive now moved onto ncis as my obsession rerun of choice, SVU and I had a long standing affair. Way cool! hee hee! I love that in the pic it actually looks like Ice T is taking the picture with Tracy the Celebrity, not the other way around! Love it! haha, I love this picture! Hope you had a good trip home and enjoy the holiday week (hoooray for the semester being over!)! Good gracious, I live under a rock. Thanks for the links; I love when bloggers give me good stuff to read. Never heard of Hellebuyck until this very moment... as I said, under a rock. And Ice-T? Seriously? I love it.